These categories of documents are known in legal terms as those falling under "P2" and "P5" exemptions. 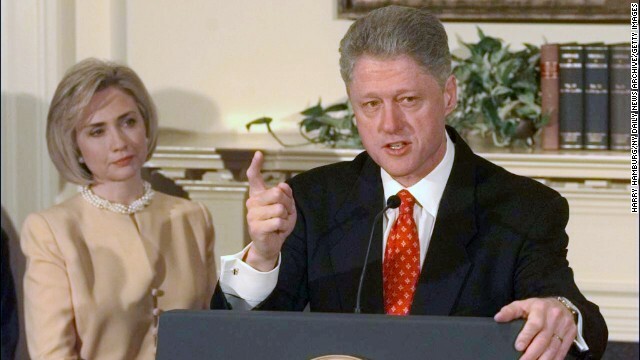 "[R]epresentatives of the former and incumbent Presidents have approved the release of a majority of the approximately 33,000 pages of Clinton Presidential records that were previously withheld under the P2 and/or P5 restrictions of the Presidential Records Act," Chris Isleib, a National Archives spokesman, said in a written statement. "Our goal is to make these records available as soon as possible, but it will take the Clinton Library and [the National Archives] additional time to complete the logistics of making available such a large release, including being able to make the records available on the Web. We will let you know as soon as we can when the records are available," he said. Isleib added that the White House has instructed the National Archives to extend the review period for the records to March 26, 2014. The complicated legal process surrounding the documents and the updated timing of their release to the public were first reported by Politico on Wednesday. Under the Presidential Records Act of 1978, which governs the handling and release of records from the Reagan White House onward, presidential records can be withheld from public release for a period of 12 years after the end of an administration if they fall under one of six restricted categories. These include classified national security information, confidential business information and trade secrets, and unwarranted invasions of personal privacy. The 33,000 pages of documents pertaining to federal appointments and confidential communications, the so-called "P2" and "P5" exemptions, also fall under the 12-year protection of the Act. After the 12-year mark from the end of a presidential administration, which for Clinton came in January 2013, the records are subject to the same restrictions as spelled out in the Freedom of Information Act, with one key exception. Congress excluded presidential records from exemptions based on executive privilege. However, since the passage of the law, Presidents Ronald Reagan, George W. Bush, and Barack Obama have each issued executive orders clarifying the process under which an incumbent President or former President could assert executive privilege to prevent the release of documents. In this case, the Obama White House as well as Clinton's office have both cleared the way for the bulk of the documents relating to confidential communications and federal appointments to be released. The National Archives did not respond to a CNN inquiry as to why these documents were not available more quickly after the expiration of the 12-year period. Prior to the passage of the Presidential Records Act during the Carter administration, White House documents were treated as the personal property of the President. The Act established public ownership of presidential documents from the 1980s onward, although it grants the incumbent President with the ultimate authority to manage the records of his predecessors. The law also subjects presidential records to disclosure requests under the Freedom of Information Act, which a former archivist of the United States said has actually hindered the process under which records are released to the public. The White House records of Presidents Hoover, Roosevelt, Truman, Eisenhower, Kennedy, Johnson, Ford, and Carter, which fell outside of the scope of the Presidential Records Act, were donated to National Archives with provisions detailing which documents were to be withheld from the public and for what period of time. "Because these materials at these libraries were donated to the United States, they are not subject to request under the Freedom of Information Act or any other public access statute. This meant that the library staff were able to process and open most records in an organized and systematic way based on how the records were filed or arranged," said then-Archivist of the United States Allen Weinstein in March 2007 during testimony before Congress. "Such 'systematic processing' is generally much more efficient and less time-consuming than processing in response to FOIA requests." "In contrast," he added, "PRA libraries in practice open records almost exclusively in response to FOIA requests ... and have less opportunity to conduct systematic processing of records." The upcoming release would not be the first documents released from the Clinton archives. The library routinely releases records in response to FOIA requests, although there is a sizable backlog. Records were also released during the Supreme Court nomination of Elena Kagan, who worked as a White House lawyer during the Clinton administration, and also as a result of ongoing legal action from the conservative group Judicial Watch. Interest in the often unglamorous world of archival research has spiked due to the possible presidential candidacy of Hillary Clinton in 2016. Earlier this month, an article by the Washington Free Beacon on the papers of the former first lady's close friend Diane Blair lead to increased scrutiny of the special collection housed at the University of Arkansas in Fayetteville. problem is none can find all of the clinton documents anyway…mz clinton has been hiding or destroying documents since the Nixon hearings back in 1974…. she should have been locked up decades ago and disbarred as well. The Cintons are comeing soon folks they have lots 0f tricks an surprises for you . Dont get tricked . How long does it take to remove any and all important information from the records ? I have no doubt that any incriminating documents concerning Bill or Hillary Clinton's actions in the White House will be classified and withheld from the public for another 50 years. Heck, she gets 4 people murdered in Benghazi (one an Ambassador and a direct report to her) and she never even gets interviewed about it. That is the level of protection the left has put around Hillary Clinton. But shouldn't we be allowed to know the truth? Or are we going to be lied to and stonewalled yet again by the Democrats? I can see GOP hopefully licking fingers hoping for something salacious to derail Hillary express to the white house. She is our next president, get used to it.